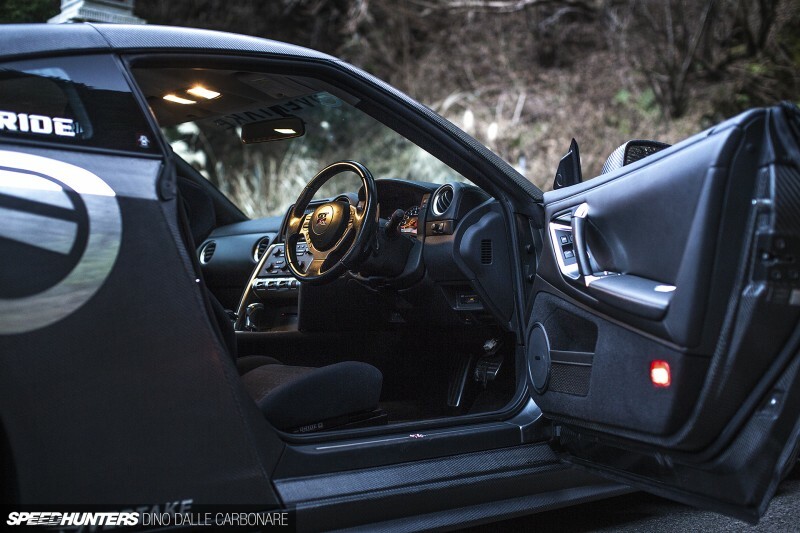 And that is precisely how I got to borrow the Overtake GT-R demo car for a few days last month. Now, it’s not every day that tuning shops throw you the keys to their one-off development cars, especially one like this particular car, which, if you haven’t figured out yet, runs a complete dry-carbon body. And when I say complete, I really do mean it: every single panel has been swapped out for a lightweight carbon equivalent – proper pre-preg carbon that is cooked in an autoclave, not the cheap dress-up stuff that way too many play off as being the real deal and that is often heavier than the part it replaces! So while blasting around in a 600hp R35 is a fun exercise in itself, there was more to this Dream Drive than that of course. What I wanted to gauge was how attention to detail, the ‘less is more’ approach, really made a difference out in the real word, something I’ve been wondering since actually seeing the car for the first time two years back at the R’s Meeting in Fuji. When people do things differently from the norm, I take notice. Especially when quality seems to be the underlying goal. Overtake inspires itself to the level of work that Pagani has with their cars, and that’s a very good goal to set because very little comes even close to matching that level of execution. 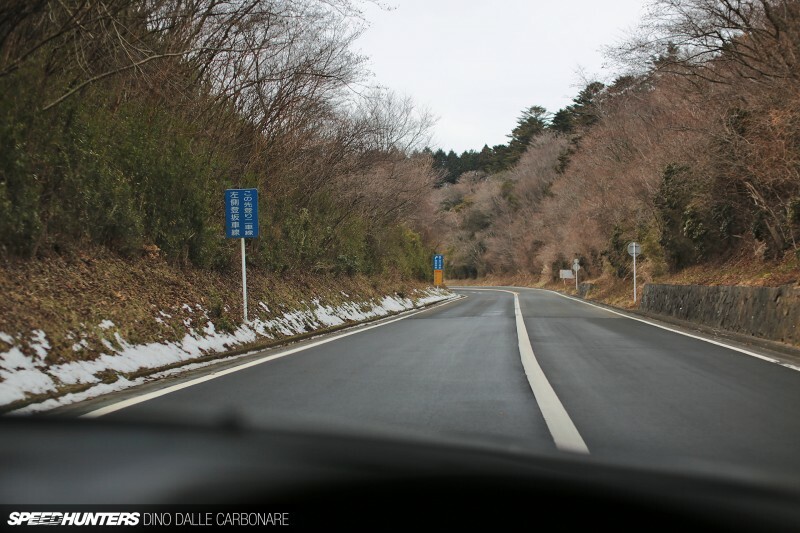 So after spending a day driving the car around Tokyo, as I would any other GT-R – this is after all the everyday supercar for everyone as Nissan has always marketed the car – it was time to take it to some proper roads. Start of the journey would be Denenchofu station, where I met with the video crew that would be filming the car for a promo video the same day. 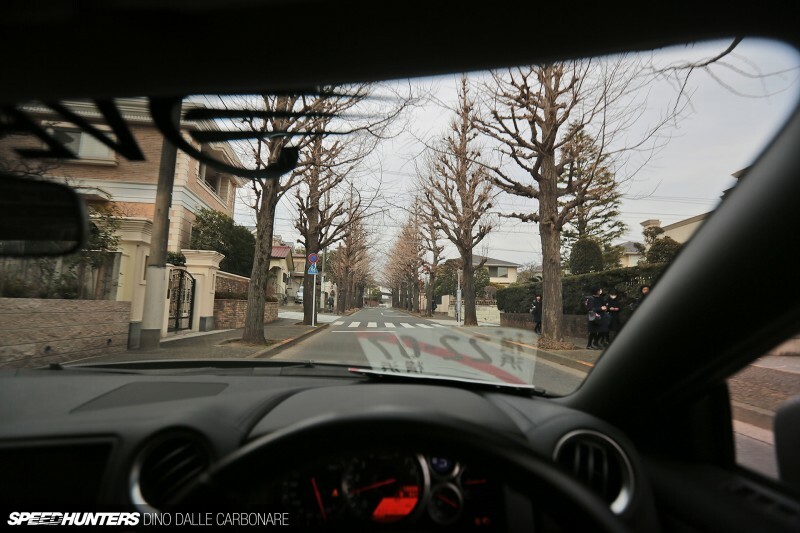 Driving this beast through the quiet streets of one of Tokyo’s wealthiest neighborhoods felt rather fitting. 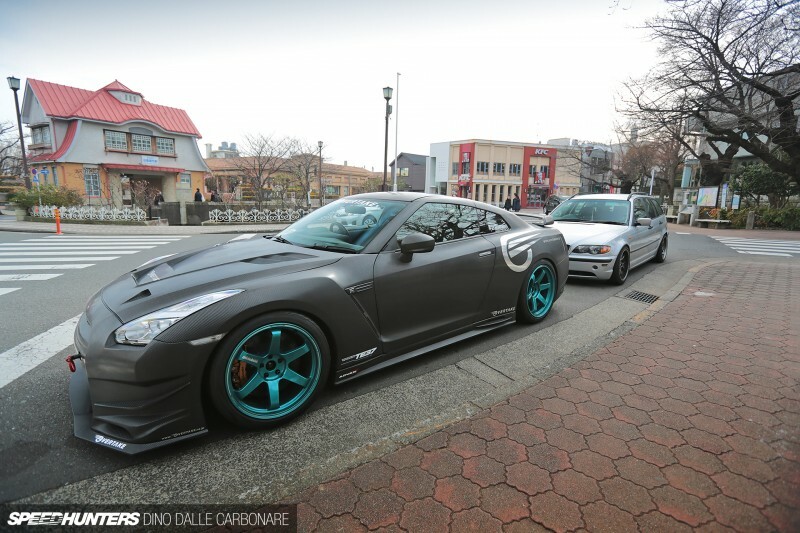 It may just be a GT-R but it stands out for being different from any other R35 around. From there it was a quick drive up onto Kanpachi-dori, where some weekend traffic had to be swiftly dealt with thanks to some cunning lane hopping. 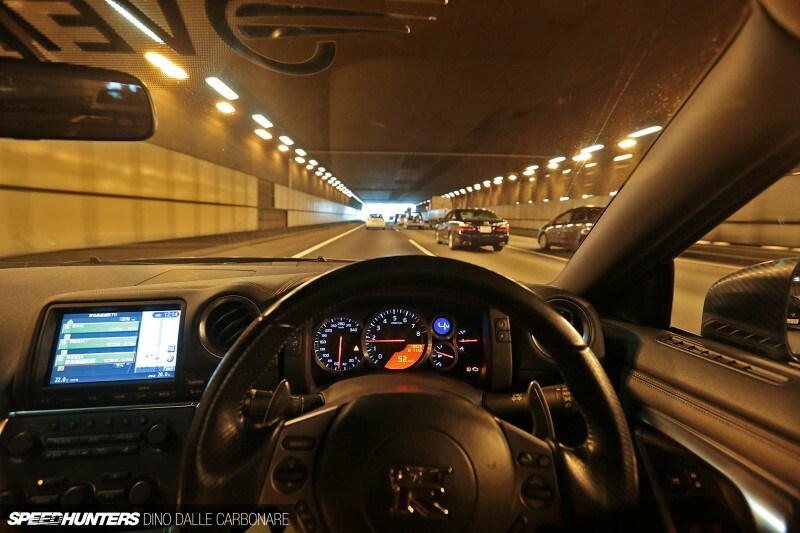 Before long, I managed to get onto the Tomei Expressway: everyone’s escape route from the busy city, the gateway to deserted countryside and semi-pure air. You’ll have seen enough of my Dream Drives that feature this particular expressway so I’ll skip the details this time round. It will save me complaining once again for the extortion that is the Japanese highway toll system! 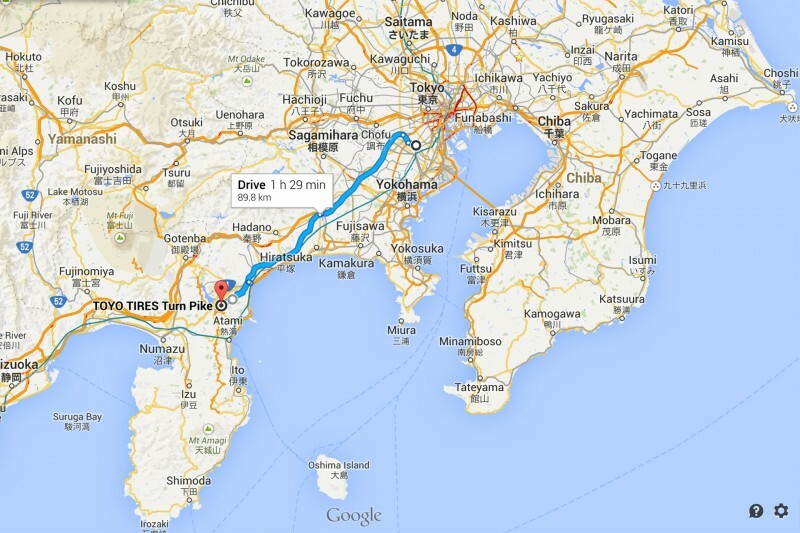 The route was pretty straightforward: it would take me down to Atsugi, where Nissan’s technical center is located (I though I’d just throw that little piece of information in there for you) and from there get onto the Odawara-Atsugi road, yet another toll road. After cruising through some pretty slow-moving traffic on the Tomei, I was happy to finally manage to rev the VR38DETT past 2,000 rpm! 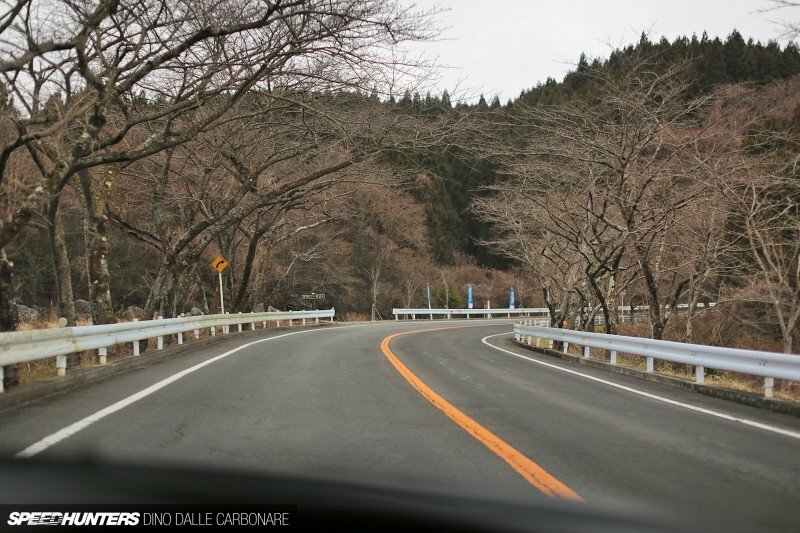 That unfortunately didn’t last long because the Odawara-Atsugi roll is heavily patrolled by undercover police cars and the most you can safely do without getting yourself in trouble is 70-80 km/h. So once again the GT-R’s cruise control came in handy. The only thing keeping me awake was the lovely deep frequency emanating from the Power House Amuse titanium exhaust system. 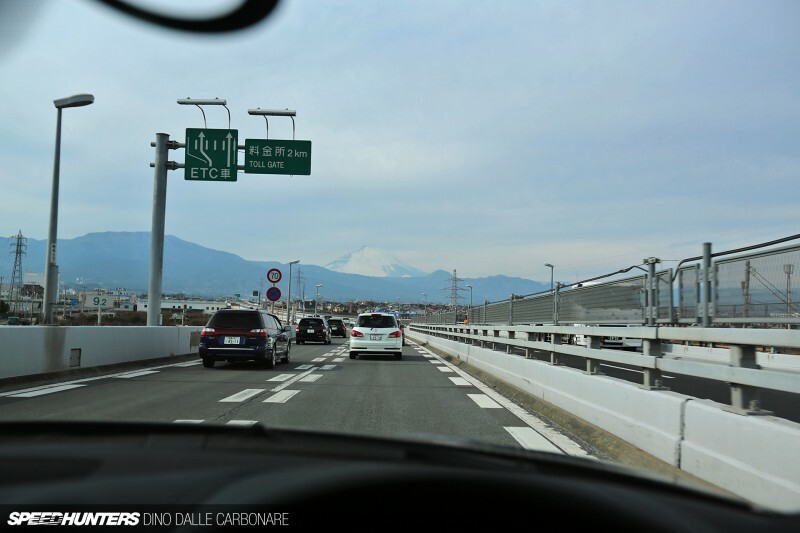 Still, it’s once your eyes meet the view of a snow-capped Mr. Fuji that sheer boredom begins to turn into excitement as the Hakone Turnpike gets ever closer. One quick squirt up the first initial section of the road and I really just wanted to get out and stretch my legs, which turned out to be the perfect opportunity to start getting some shots of the car as a few stray rays of sun pierced through the hazy skies. Imposing is probably the best adjective to use when describing this car. I have probably driven over 50 tuned R35 by now, but none have really done the job in the visual department quite so much as this car. It’s probably because I know that what I am seeing has substance. 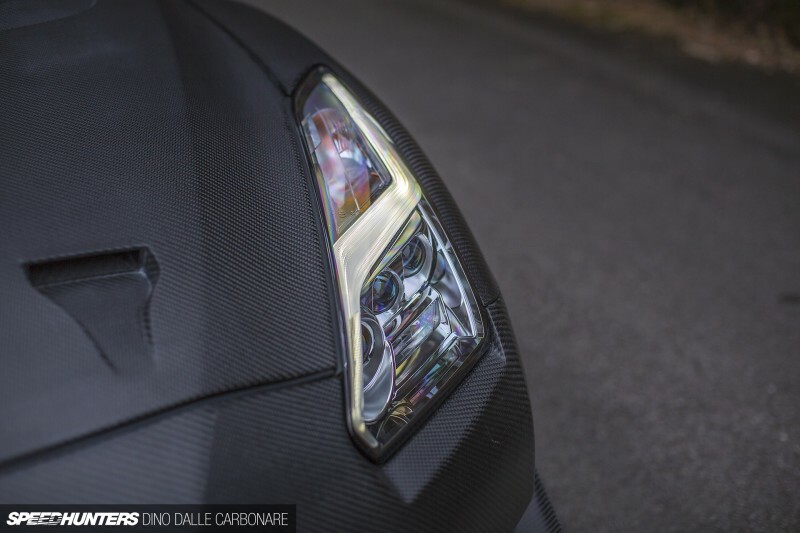 That is indeed all dry carbon: it’s there because it helps shed quite a lot of weight and that can only be a very good thing on such a porker of a car. Plus the guys from Overtake in no way altered the way the car looked from TAS, so it was still slammed on that rather fitting set of metallic aquamarine blue set of 20-inch RAYS TE37Ultra, with a nice handful of front negative camber to make it look all that more badass. But let’s put the looks aside for a second. I’m sure that by now you’re probably wondering what this thing is packing under that lightweight vented bonnet. Well, here it is in all its glory. The engine itself is actually stock; no, no, wait, don’t have the usual reaction to a statement like this, at least have the decency to hear me out. 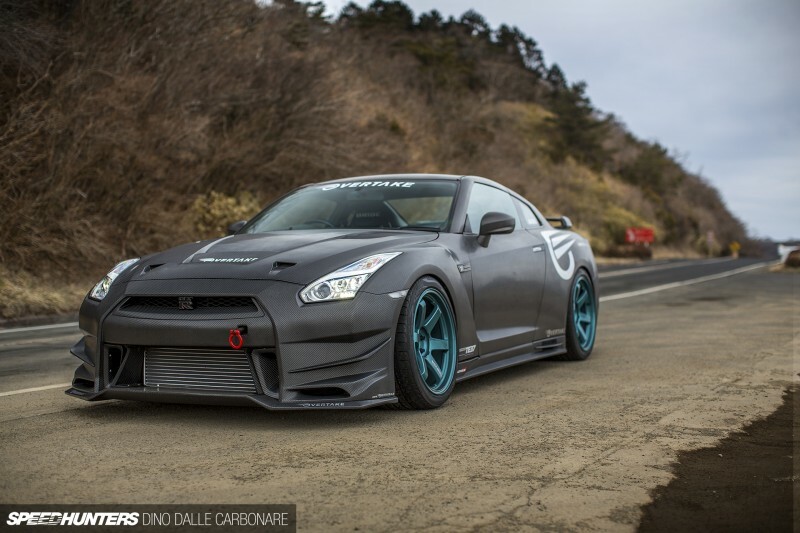 A GT-R that has nothing near 1000hp? What travesty is this I hear you wonder? But come on, let’s not forget the pretence I opened this post on. Less is more, remember? 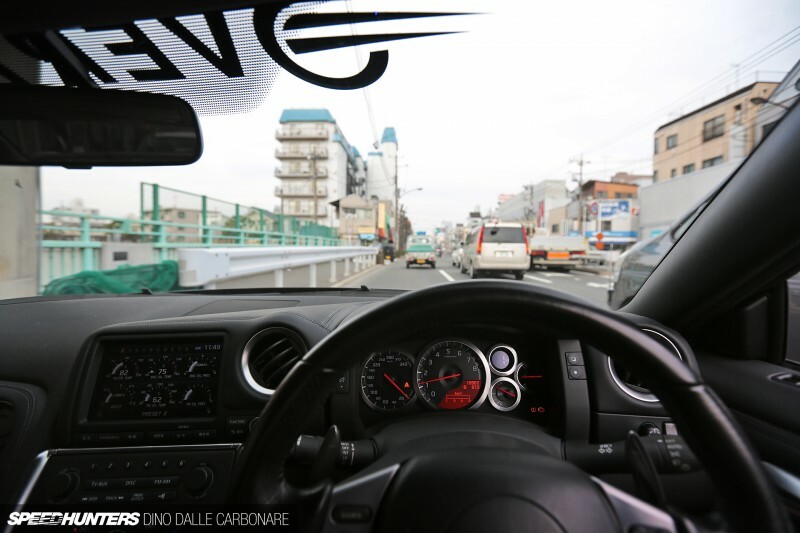 What Overtake are attempting to provide is a platform like no other, upon which you can build the GT-R of your dreams. That’s why they don’t go beyond the upgrades you see here, which start off with a beautifully fabricated intake plenum made in collaboration with Power House Amuse. What they created is an STTI titanium work of art – to put it mildly – that works great on a stock car, boosting power by 10hp, and is specifically designed with big power figures in mind; anywhere up to 2000hp actually, for those attempting to build the most extreme drag car out there. Minor modifications followed, like a hard pipe kit and GReddy BOVs to tighten up boost response when on the power. It all works well together, as you would expect, because if one thing is for certain, it’s just how well the VR38 responds to these initial sort of upgrades. Tying everything together is the Amuse Hi-Tec ROM which helps bring power up closer to the 600hp mark. So while most will probably do a lot more to their engines, it’s back on the car’s skin that Overtake really took their time seeking perfection. 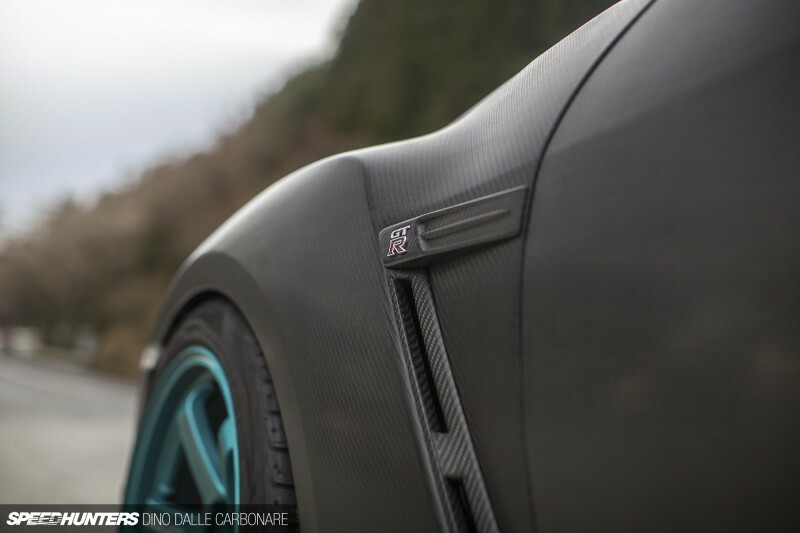 It really did feel like I was back at the Pagani factory as I carefully admired the faultless way in which the carbon fiber has been laid. Even on the back of the bonnet, it’s as good as it gets, every curve, edge and indentation moulded straight off the back of a stock unit. Of course Overtake have taken time to add some aggression into their own design which along with the main central air outlet, includes a pair of NACA ducts on the front part to direct air down towards the turbos. 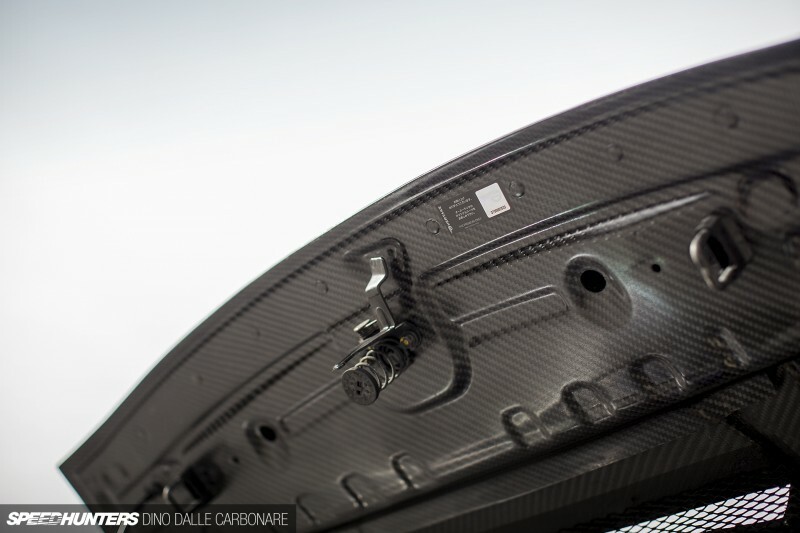 Notice on this image how the carbon weave matches from bumper to bonnet. Along with the air guides that channel the air from the NACA ducts to where the turbos are located, there’s also a pair of additional outlets to help keep that air flowing out. A cool engine bay is a happy engine bay! Overtake will sell you either the complete carbon fiber body as a kit, or piece by piece, whatever the potential customer may require. With everything having been moulded off stock Nissan parts, it all fits and aligns like factory. The front bumper, with that enlarged main air dam also features additional side intakes that direct air towards the brakes and the oil cooler, all with their own carbon fiber ducting. 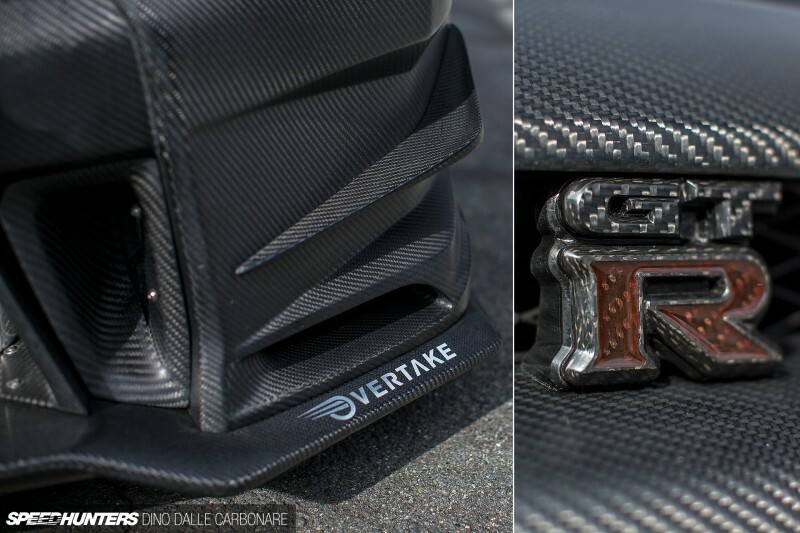 The GT-R emblem on both the front grille and rear bumper is carbon fiber, but what one cannot possibly note is the actual advanced production techniques that were required to make this badge. 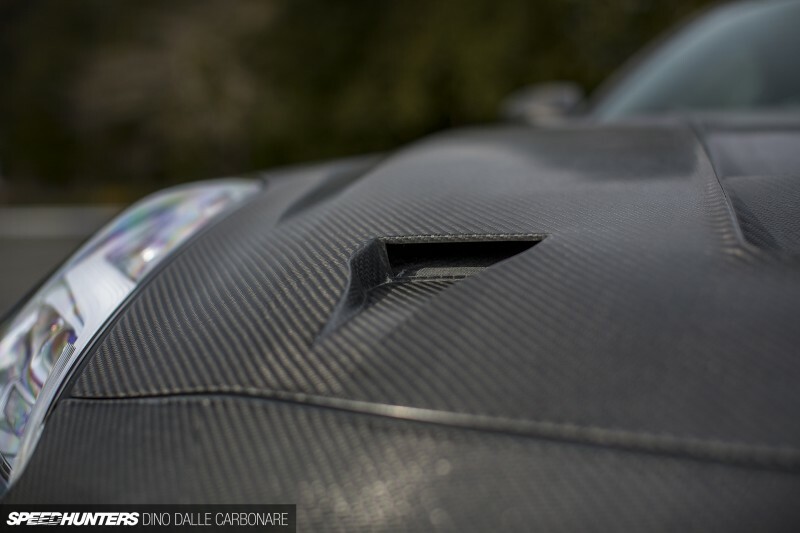 It all starts off with a carbon fiber block, 15-layers thick, and it then gets milled away by a special diamond-tip and sculpted into the GT-R badge you see above. That’s the same process Audemars Piguet used to create the casing for their $50,000 Royal Oak Offshore carbon watch. Impressive stuff. But let’s talk weight. 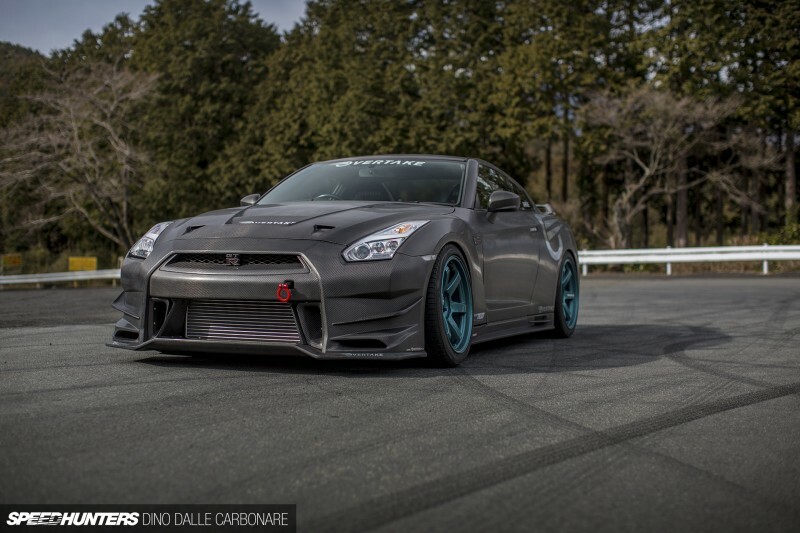 About 140kg has been shaved off the curb weight of the R35 – that’s like two fully-grown JDM spec men. Areas like the front fenders are where most weight could be saved, with each weighing in at 2.4kg – that’s 6.4kg less than stock, or a saving of 73%. Certainly it all begins to make sense. 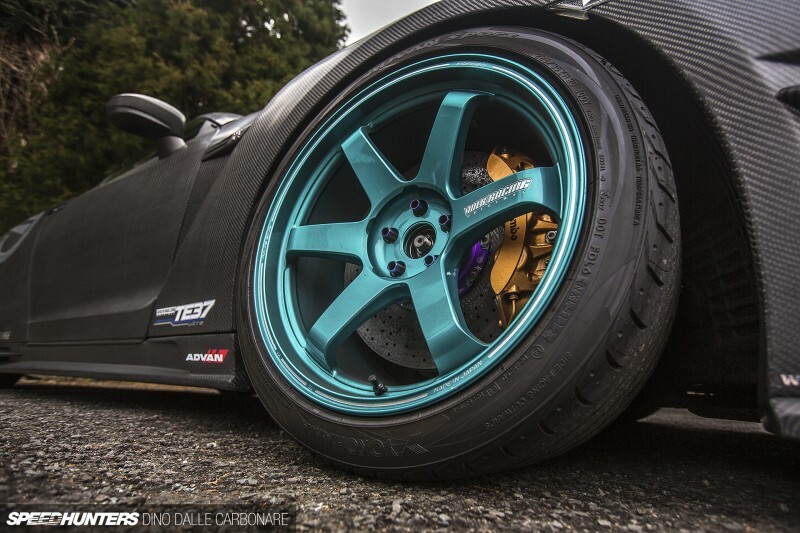 Those big 20 by 11-inch TE37Ultras hide another area where considerable mass has been shed: the brakes. While the Brembo calipers the R35 comes with have remained stock, the rotors are special items created by Brembo. They are bolted onto an anodized floating bell and come with strengthened caliper bolts that take into account the added braking performance. Endless have developed the special compound that Overtake required for the brake pads and I was pleasantly surprised how damn well it worked on the street, blowing away similar set-ups offered as OEM by established manufacturers. This is the most expensive upgrade fitted to the GT-R at $15,000 but it’s one that also brings a 54% drop in weight from one of the areas that counts the most! A drop of 25.5kg of unsprung weight is substantial and instantly perceivable out on the road; it only takes one corner to feel. The weight keeps coming off with every body panel that you look at: the roof – 4.6kg or 63%, the side skirts – 500g or 25%, the trunk lid – 3.3kg or 50%, the rear spoiler – 4.2kg or 64%. Every part also has a seal of authenticity displaying the Overtake hologram logo along with the part’s serial number. The rear fenders weigh 14.7kg less than the stock items, which is 67% less. 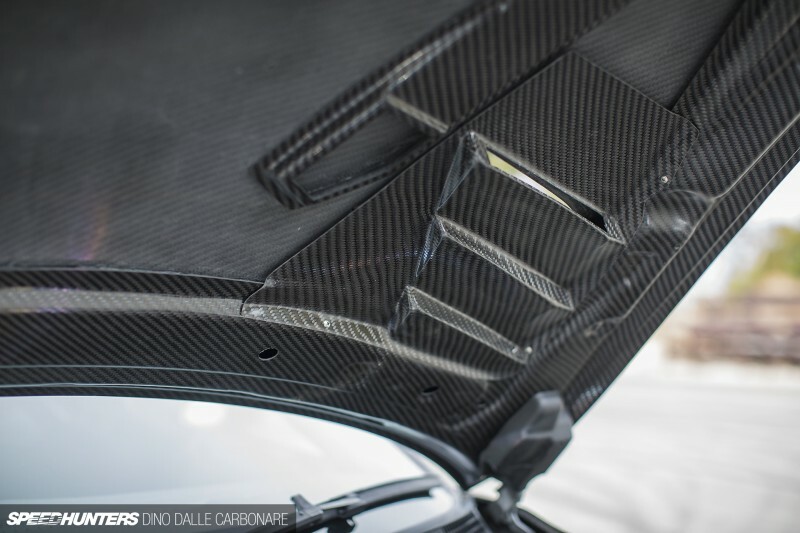 These extend right up until the chassis, itself like the OEM ones, so no matter what you check, even inside the fuel filler, it’s all carbon fiber. The doors on a stock GT-R are aluminium so pretty light, but the Overtake ones are close to 10kg less in weight – exactly half. 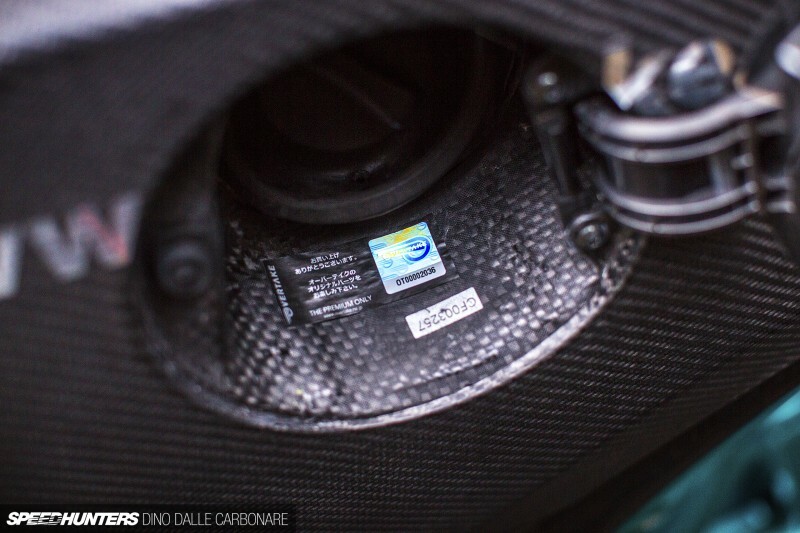 I found it really funny how even the ALCOA logo on the door was moulded into the carbon weave. It’s one of the coolest little details of the car, if you’re a nerd like me! 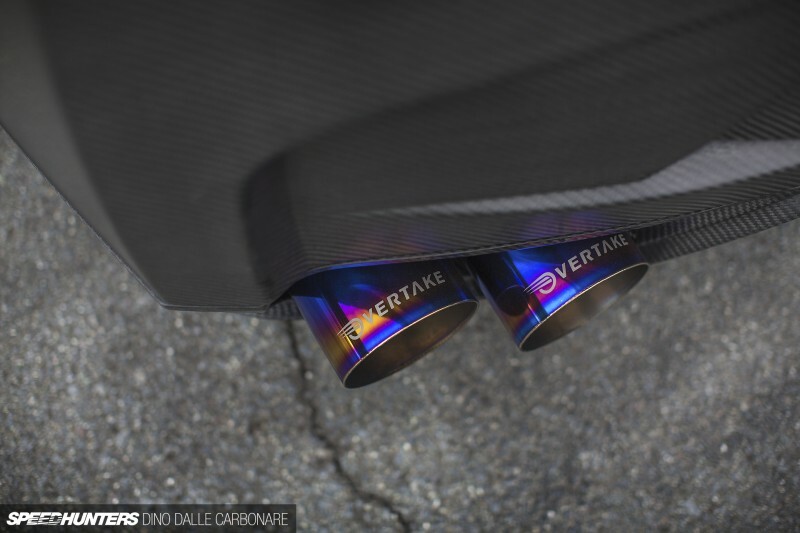 When it came to getting a very special exhaust done, Overtake contacted Matsui-san of Power House Amuse once again. 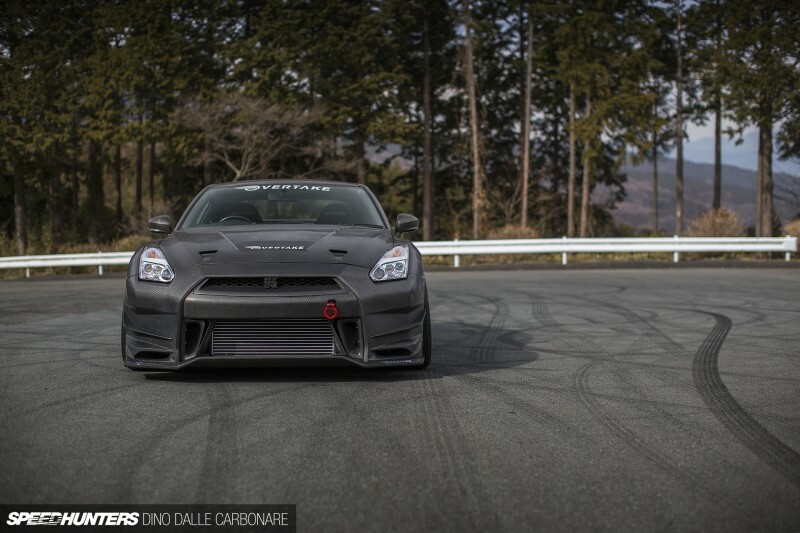 When asked to come up with one of the best possible systems for the GT-R, this is what he decided on. The system is made up of a 100mm center pipe and 100mm main section, all Amuse-spec STTI titanium and ends with four extended tails like you see here. 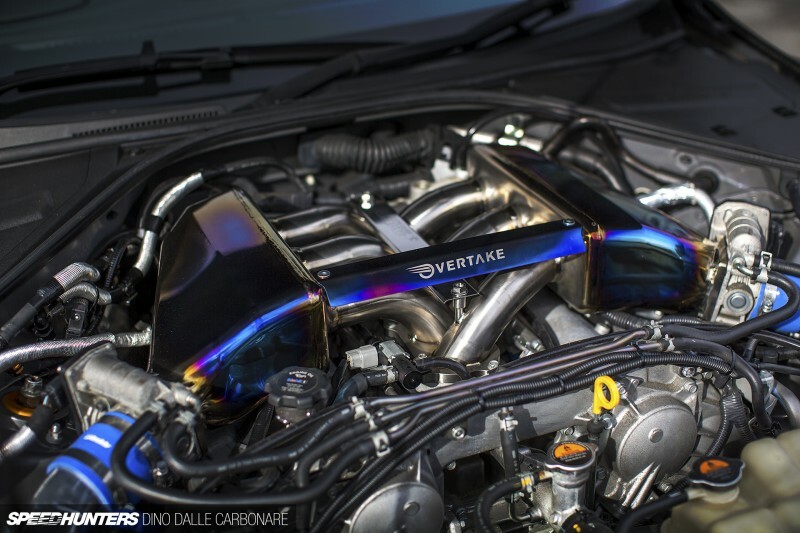 The Overtake logo is laser-etched on each pipe. There is even a valvetronic function that mutes the sound for when you don’t want to wake the neighbors up. 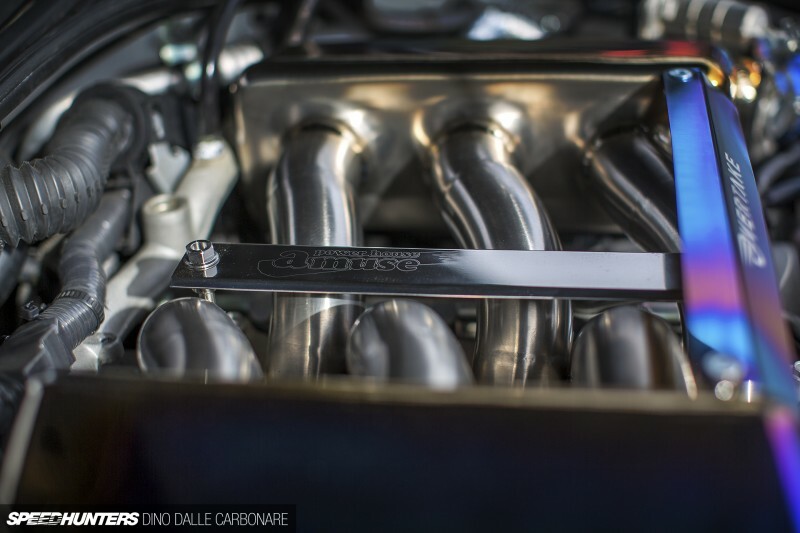 This exhaust is designed to support 1000hp and adds even more of a weight saving to the whole package. 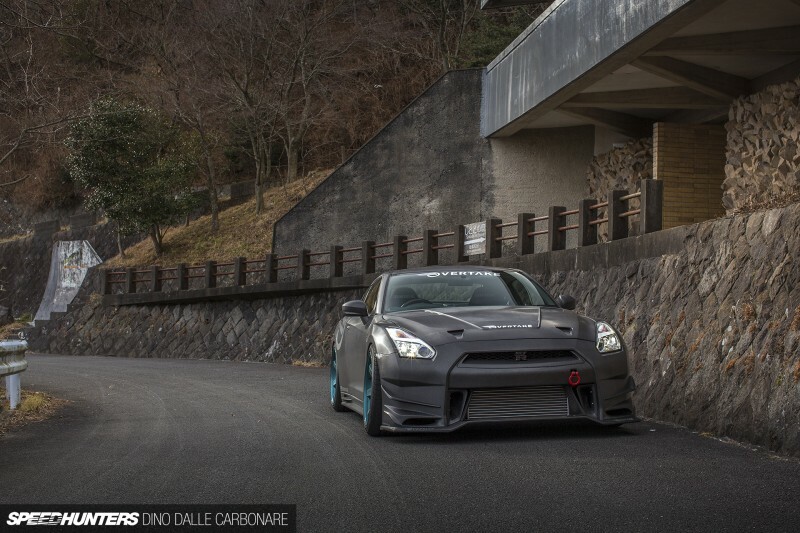 Seeing that literally every GT-R owner is doing this kind of upgrade in Japan right now, Overtake too fitted the all-LED headlight set-up from the recently introduced 2014 R35. That includes the new tail lights too: a more modern sort of afterburner design. 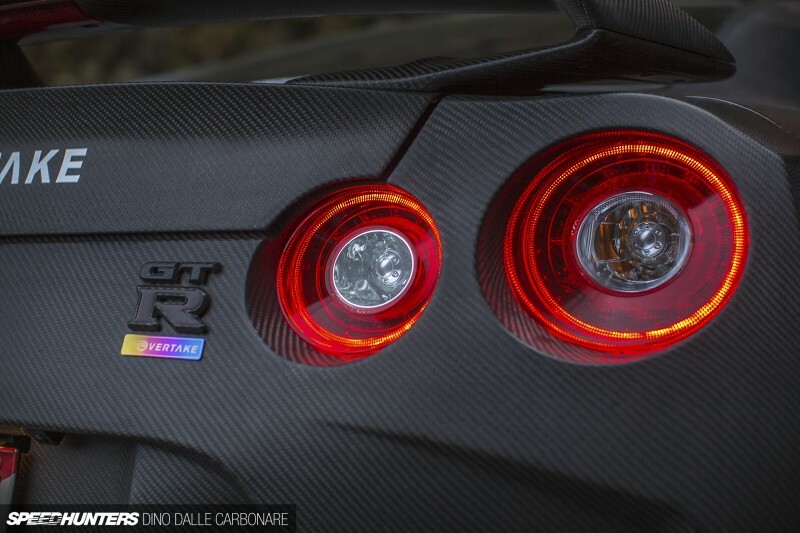 Here you can also see the rear GT-R emblem and the titanium Overtake badge – some more reminders of just how much details count on this car. After taking a nice, close look at the GT-R, it was time to get back on the road, and fully enjoy the deserted corners of the Turnpike. It’s here that the car really started to shine, with every third and fourth gear corner the ‘R’ felt alive, controlled, and almost effortless in corner entry. And since I was out there to also help out in the making of the official Overtake promo video, you can hit play above and see and hear the bespoke GT-R in action. I certainly didn’t pass up any opportunity for more pictures; it gave me a breather from the driving which can at times be pretty intense with the pace you can carry through some of the Turnpike’s most challenging corners. 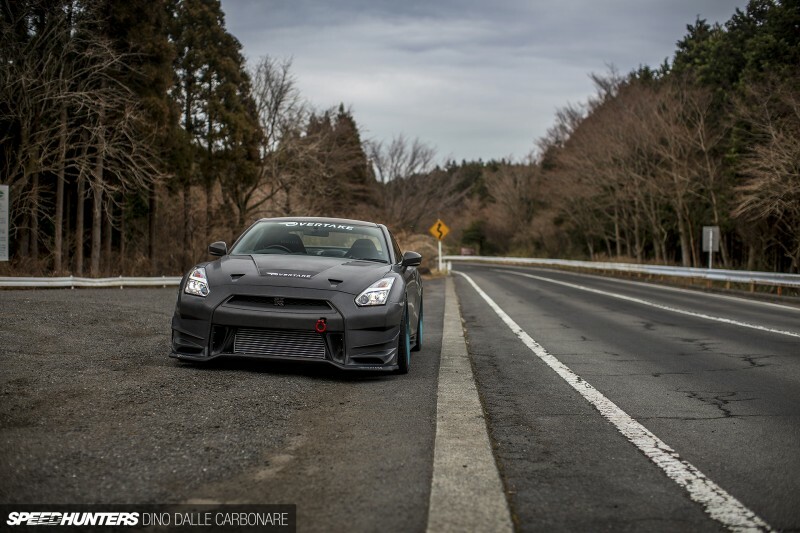 The Amuse R1 suspension it runs is a superb kit, pushing the envelope of performance without taking away from the drivability the GT-R is known for. The car is also fitted with a slightly modified set of Kansai Service suspension arms for a more performance-oriented geometry set-up and oh boy, did all that negative camber make the car take even the tightest of corners at impressive speed with not a hint of understeer. One of my favourite views of the car is the rear end: menacing and ready to attack the road in front of it. So that’s precisely what I did! 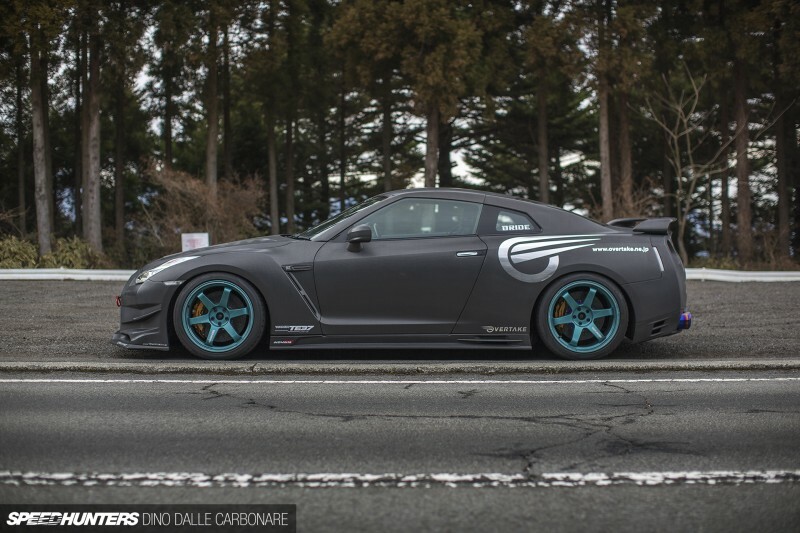 Even with the roads being quite slippery in some areas, the R35 thundered on at whatever pace you demanded. The brakes were strong with an instant and very progressive pedal feel, not overly sensitive like some carbon set-ups can be. The drop in unsprung weight however was really perceivable, adding more precision and adjustability with a smidgeon of added steering feedback. That more is less thing was really making sense by now. Despite the car only running a mildly tuned engine, it felt like it had so much more power than the numbers suggested. Acceleration, like in any other GT-R, is best described as violent, always ready to catapult you out of any situation, straightening you out of mild drifts in a totally GT-R-like sort of way. People that have driven an R32/33/34 and 35 in anger, will know what I’m talking about. No matter how many times I drive the Turnpike, I never get bored with it. The sheer length of the thing will always challenge you no matter how well you know it and with dark grey skies that day, it had probably scared off a lot of potential tourists, so it was literally all mine for the meagre ¥700 toll charge. Wanting to see if I could get a nice view of the Pacific Ocean before the road turned back into itself and faced the mountain chain again, I stopped one more time. 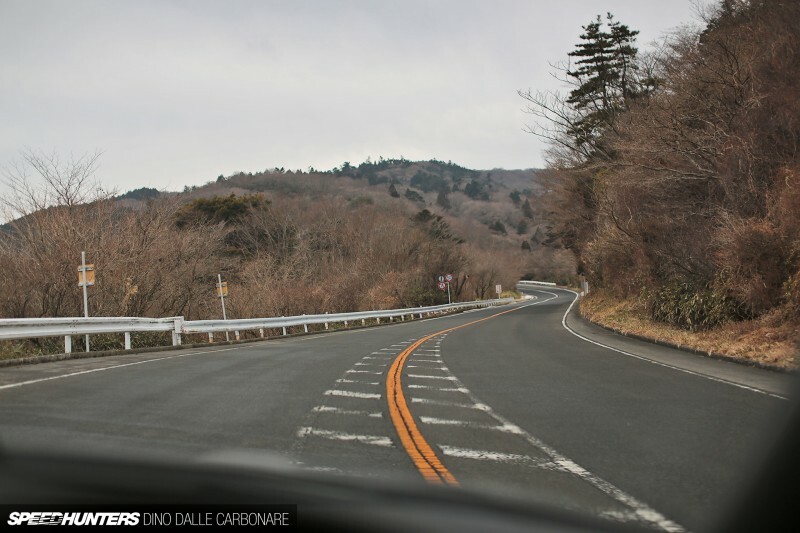 While the view was obscured by low clouds and hazy moisture in the air, the view of the GT-R wasn’t so, and it was almost impossible not to indulge furthermore. From there it was just a final quick blast through the last, mostly straight, but very undulating section – always a great test for suspension and to see how it copes on hard compression. No problem here; the GT-R tracked straight without any issues, screaming up the hill and continuing to pile on the speed. Mission accomplished. I had conquered the mountain as one would say, and my reward was an epic view of Mt. Fuji and its snow-covered cone. If that wasn’t enough, in the rest area were these two tuned four-door Hakosuska, which I just had to park right next to for a little historical gathering. More than forty years separate these cars! 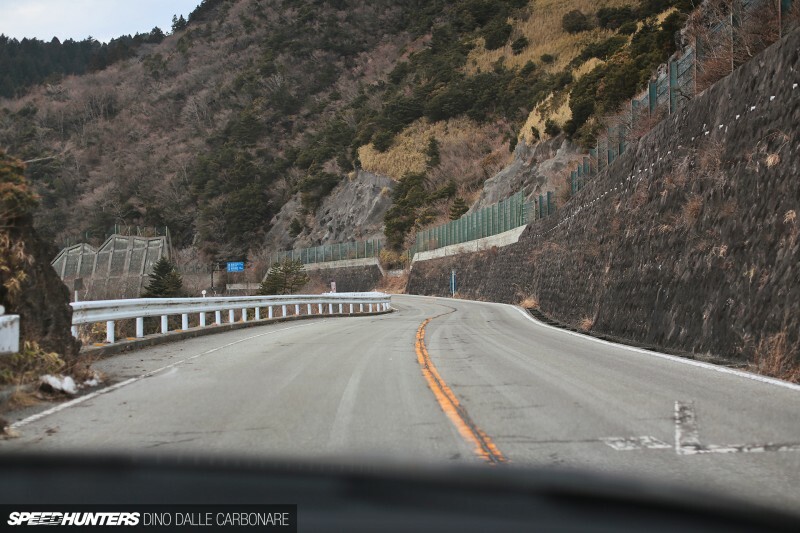 The drive continued down Route 75, or the Tsubaki Line, a touge I just can’t resist to drive a couple of times up and down as it’s a perfect mix of corners and straights. Speeds don’t ever get quite as high as on the Turnpike; it’s more a test of low speed grip, turn in and low-end acceleration, not to mention braking. 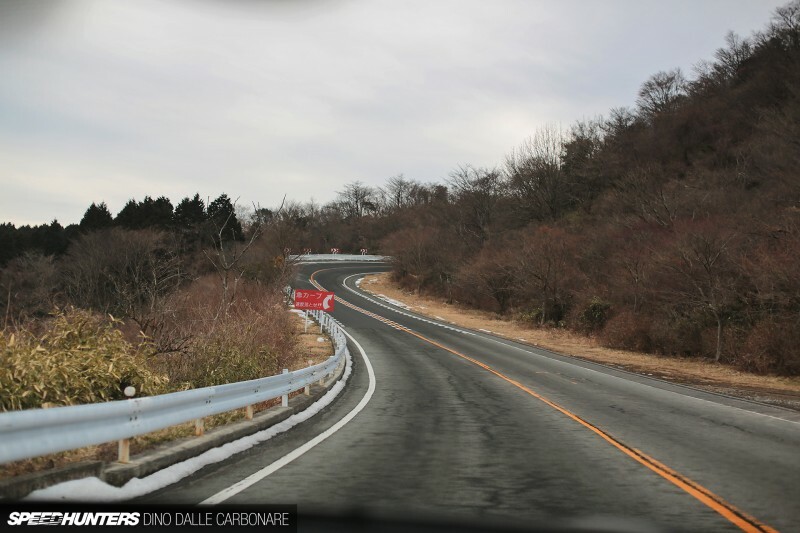 Last time I drove this road in my R34, I had no brake pedal by the time I was at the bottom. 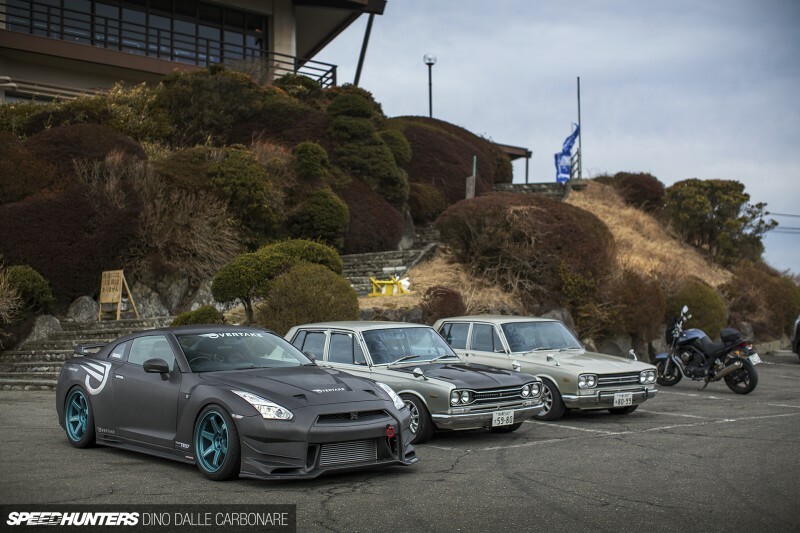 No such issues with the Overtake GT-R. It didn’t flinch one bit, seeming to take everything in its stride, the 140kg of weight loss becoming even more important on these kind of roads. 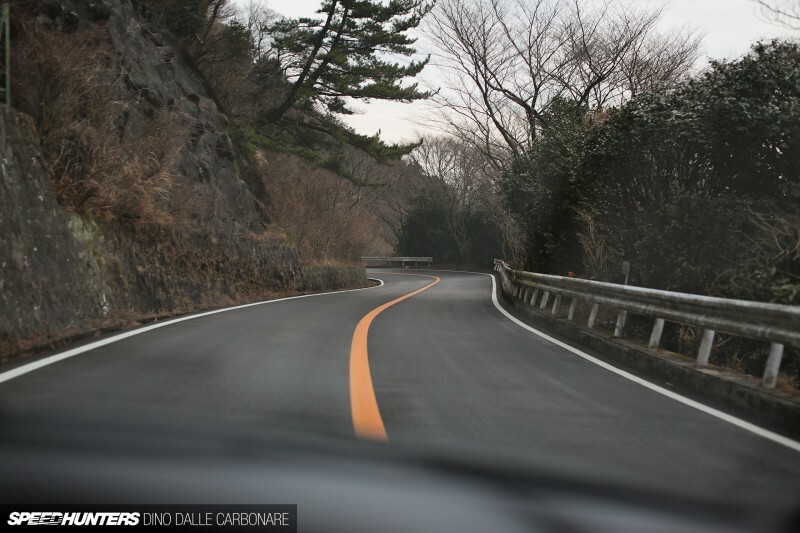 Here’s an example of just how smooth Japanese mountain roads can be; one section that has recently been resurfaced with what may well be circuit-spec tarmac! About half way down the mountain is a little rest area which I sometimes stop at. Before the light disappeared even further, I wanted to look at one final area of this car’s impressive repertoire: the interior. 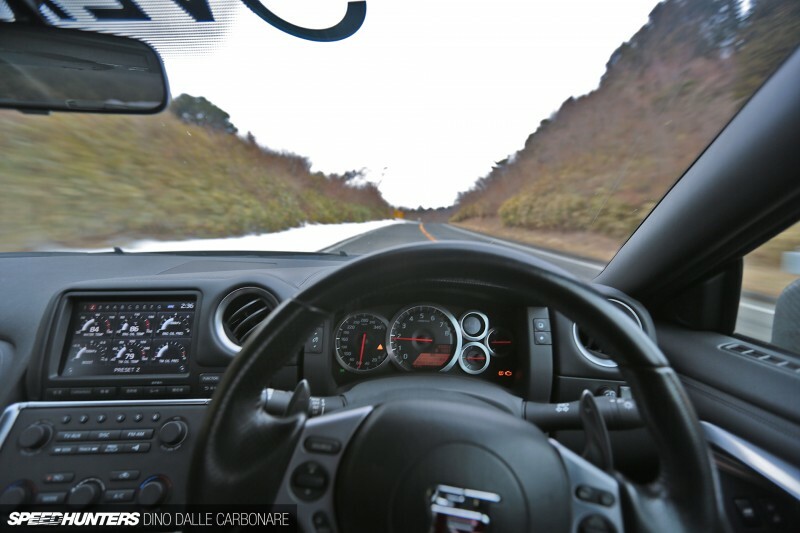 Simplicity rules in the Overtake GT-R’s cockpit. 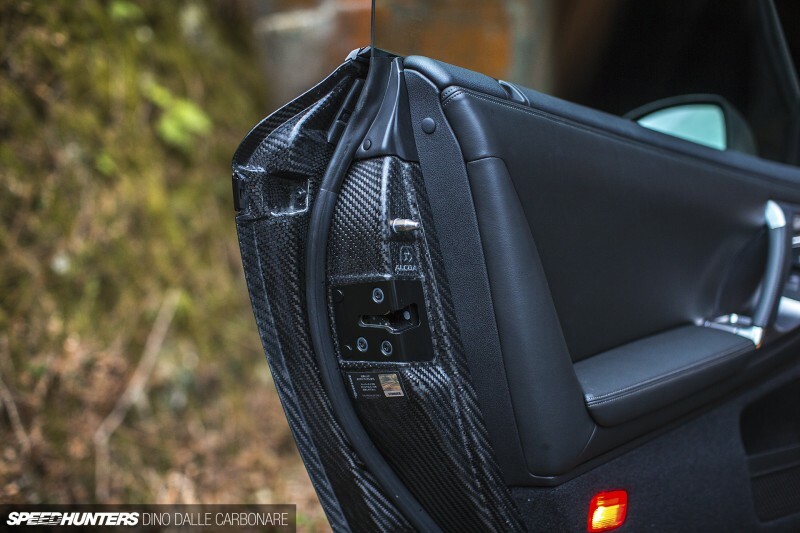 Probably contrary to what you may have thought, there are no carbon bits scattered around the interior. This is one area they didn’t concentrate on, because it just wouldn’t have had any real impact in true weight loss. 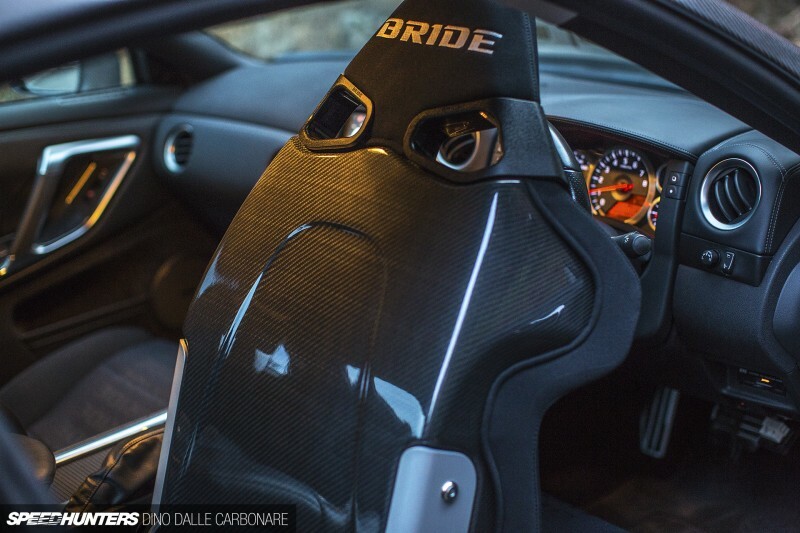 Replacing plastic trim with carbon fiber has little benefits if any, except looking and feeling nice. 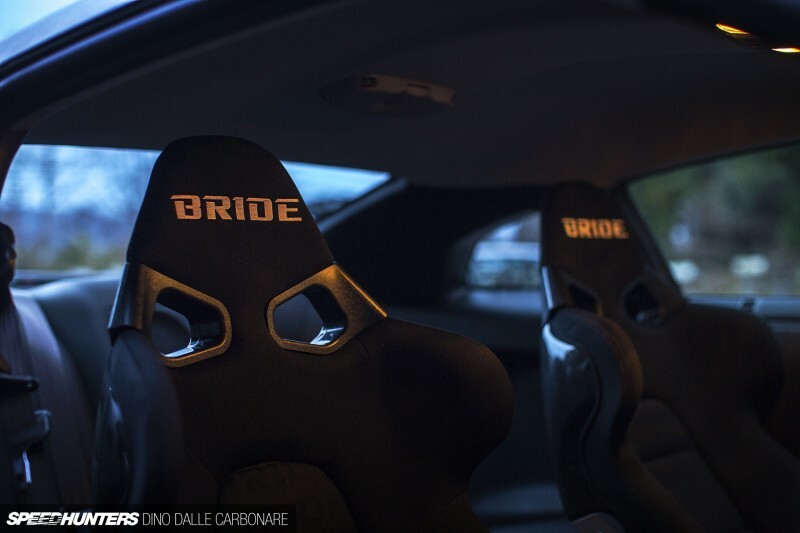 All you find in there are the reclinable Bride bucket seats, which replace the heavy electric stock ones for a more performance-oriented seating arrangement. I was definitely glad of this as the lateral Gs this R35 pulls through the corners would have me sliding all over the place on the stock leather chairs. 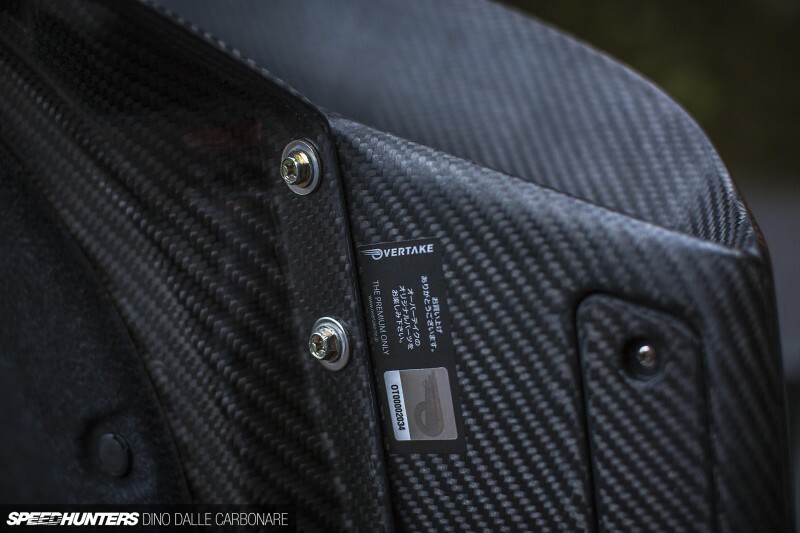 The seats too are carbon fiber. Of course! I really hope more tuners can embrace the school of thought Overtake has followed in the development of their products. Power may be important but it’s only a very small aspect of a car. The main aim of high performance street builds should always be about balance, a combination of weight saving via the use of exotic materials, an adequate boost in power and torque, handling and braking improvements, and finally, drivability which should be a combination of comfort and enjoyment- as there is very little point in creating a car you can’t use or get satisfaction from because it’s just too extreme in some areas. Overtake has certainly taken a completely different approach and I for one have come away refreshed from what is a one-of-a-kind sort of car.